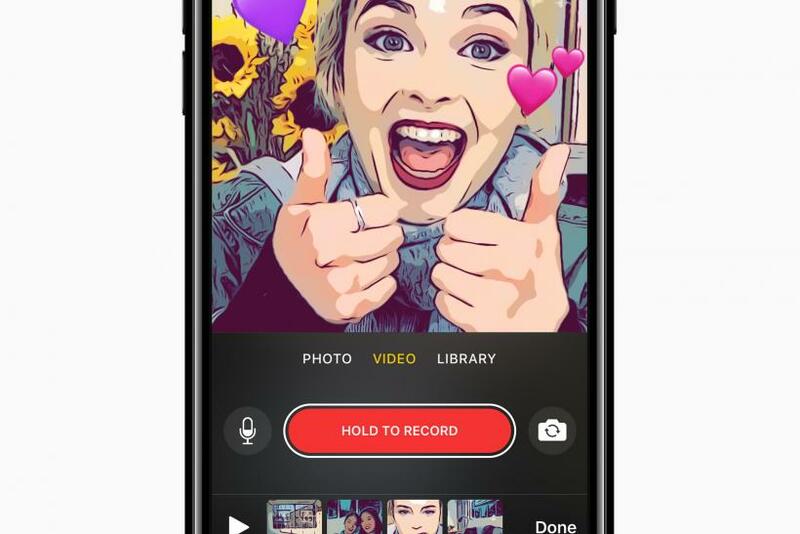 You can now edit videos with Apple’s new app Clips. The app, which was revealed a couple of weeks ago when the company introduced the RED iPhone 7 models, is now available for free on the App Store. 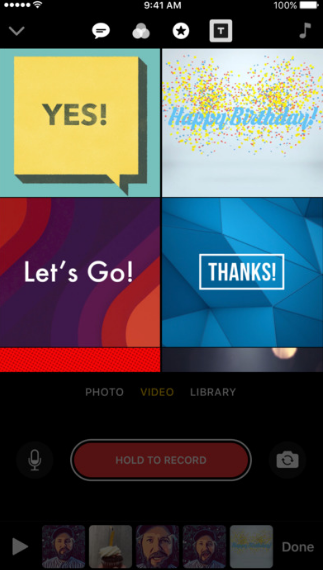 Clips allows users to creatively edit videos by adding music and animations to videos and photos from their library or taken live with the app. 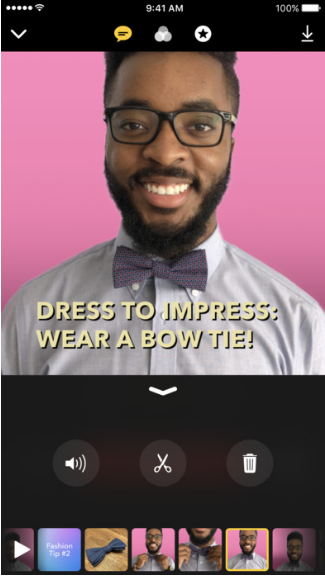 Once you download the app an intro of Clips will play automatically before getting started. To trim videos with Clips just drag the bar, similar to how you edit on Instagram. You can also reorder your clips when making a movie. 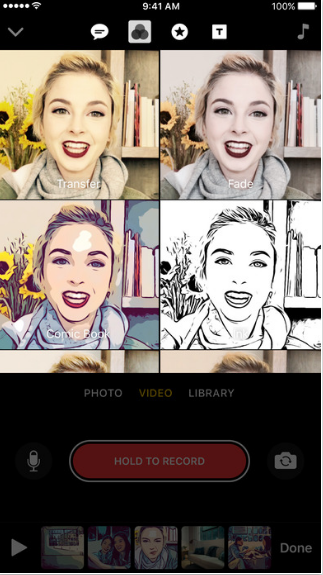 The app offers filters to choose from for your clips: Noir, Instant, Transfer, Fade, Comic Book, Ink and Chrome. You can add music to your clips by using pre-loaded soundtracks or downloading new ones under the music icon, similar to the app VivaVideo. You can also mute audio completely. Clips allows users to be more creative when making videos by adding Live Titles to your media. For example, there’s a title card that says “The End” for when your video is done, or if you’re doing a tutorial, you can add the “Step 1” title. For Live Titles, you can choose how long you want them to run and the background audio, including recording a voiceover. Other ways to be creative with clips: animated speech bubbles, arrows and banners. Also, under the star icon, you can choose from various stickers, just like you do with Instagram and Snapchat. You can add captions to your videos -- and it’s extremely easy. All you have to do is speak while recording and the captions are automatically generated as you talk to match the timing of your voiceover. You can also choose where you want the captions to appear on the video. The app suggests people to share with based on who is in your videos and those you mostly share with. 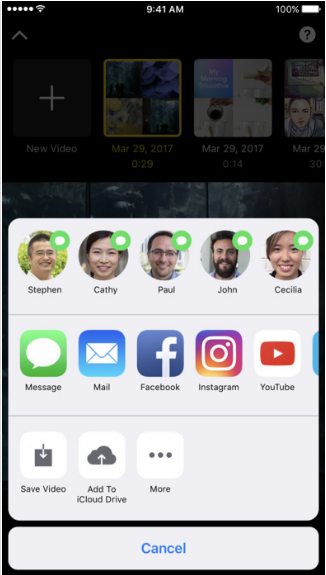 When you click on the share button those people will appear on the screen, along with other apps you can share the video with, including Facebook, YouTube and Instagram. Clips, which requires iOS 10.3, is compatible with iPhone 5s or later, the new 9.7-inch iPad, all iPad Air models and all iPad Pro models, iPad mini 2 and the 6th generation iPod touch.